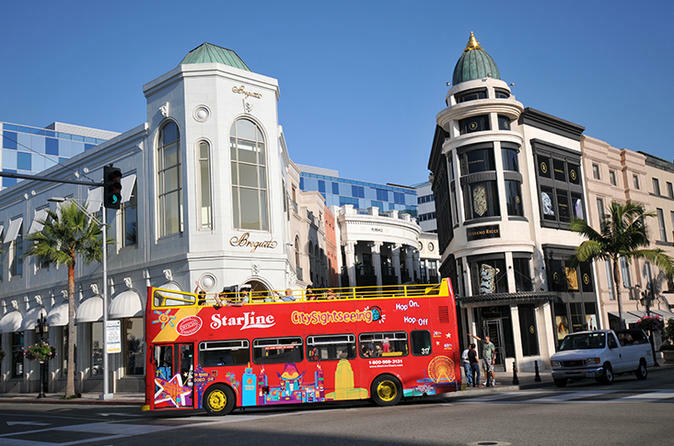 The Hollywood Pass provides the most affordable way to experience Hollywood’s top 3 attractions: The Original Movie Stars’ Homes Tour, the CitySightseeing Double-Decker Hop-on Hop-off Tour and Madame Tussauds Hollywood! These easy-to-use tickets are valid for nine days so you can experience Hollywood at your own pace. Explore popular Hollywood attractions at your own pace. See all three in one day or split up your sightseeing. It’s up to you! This combo package includes our signature Movie Stars’ Homes Tour, 24 hours of access to our Hop-On Hop-Off Double Decker City Tour, and admission to the world-famous Madame Tussauds Hollywood wax museum. Bundle these three fantastic Tinseltown adventures and save 30 percent off the regular price! Next, hop on board our double-decker fun bus! You will have 24 hours to explore L.A. on our Hop-On Hop-Off Double Decker City Tour. This open-top bus features more than 70 stops, where you can get off and explore at your leisure. When you’re ready, just hop back on, show your ticket, and continue the tour! A network of intersecting routes connect you to the entire city and informative pre-recorded commentary is available in nine languages. Finally, pay a visit to Madame Tussauds Hollywood, home to over 100 lifelike full-sized celebrity wax figures. Featuring movie stars, recording artists, sports heroes, and pop culture icons of yesterday and today, it’s filled with fun photo opportunities. The museum includes 18 themed sets, including behind-the-scenes access, so you can see how the astonishing wax figures are actually made! Special Offer - Book this tour and save 30% compared to booking each attraction separately! - Book Now!